Tomorrow I'm hanging a show in Belmar, but many of my tools are usually kept at my Studio, so I took a trip up there this afternoon to retrieve them. And as long as I was there, I figured I should advance my tower coloring a little further. 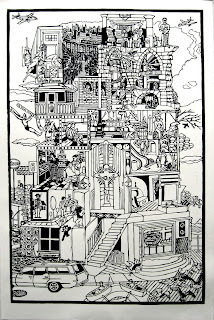 Only had an hour or so, so I concentrated on small details mostly in two areas of the tower. Down in the lower right I colored the picture on the black and white tv screen (I may adjust these grays a little in the future) and put more colors in the Bugs Bunny scene. Up above, I started coloring some of the inhabitants of the dungeon (using whatever I could find in my Gardner's as reference) and put a base color on the brick gallery wall. It matches some orange-red brick in parts of Bruegel's tower, but I may go over these again, making them a little darker, and maybe varying the color of some individual bricks. A very busy day today. After putting in a full day at my sub job, I made a stop on the way home to pick up a piece of plexiglass I had ordered over the weekend. Continued home to use it to finish framing a print that I mounted and matted late last night. Put on a label and stuck it in one of my custom boxes, the one seen above. Actually I made this one last March with the intension of using it to ship some stuff to St Louis, but that had to be delayed. Now it's on its way to St Louis, but now it contains my contribution to the Outlaw Printmakers '08 show, which will be up in late February at the Contemporary Art Museum there. Some confusion over exact dates, but I know that it definitely overlaps with the Prints Gone Wild fair going on there on Feb 23rd and 24th. More details to come. Put in a few more hours on the tower print today. I went over some of yesterday's work, darkening or adjusting colors. I continued with browns today, but also started working into some grays, golds, and yellows. So far, so good, but as with yesterday, I can't say for sure if any of what's colored is the final state. Some of that uncertainty is because there are a few sections where I still don't know what all the colors will be. Jobs will keep my busy the next few days, so I have some time to think about it before I get back into the Studio. Today I started the coloring of the tower print. As I stated earlier, the plan is to work with a basic palette of a few key colors in an effort to keep the composition unified, in this case using one similar to Bruegel's tower. Based on my experiments last time, I mixed a big pile of what I call Bruegel Stone Base, a combination of Burgundy Yellow Ochre, Buff Titanium, and Indigo. I used it in various wash strengths in the dungeon, the cityscape, the crucifix, and a few other spots. Tinting it a bit, it also became wooden building blocks, sand, and background hill town, among other things. Then I mixed a medium brown that found its way into several sections, mostly as floorboards or furniture. In a few cases I combined that with washes of black to create more weathered wood, such as the boardwalk in the lower right corner. I decided to call it a night at that point. So far it seems to be working, but I'm not assuming that anything colored today is finished. As the rest of the colors start filling in, I may find it necessary to adjust some of what I did today. 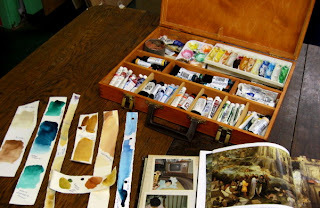 Next time I continue with the earth colors and neutrals, and maybe start on the other major group- the blues. The lack of news here over the past several days is more about my busy first week of classes than a lack of art activity. A lot of little stuff going on this week, time to catch up. Monday included a stop at the Pearl in Woodbridge to pick up some supplies. This time all stuff related to framing, since I will need to frame several items in preparation for a series of shows coming up over the next few months. Tuesday I talked to Danielle at Evil Prints, got some necessary details regarding our upcoming Outlaw Printmakers group show in St Louis. Wednesday and Thursday included time in contact with various people regarding details about the upcoming group show in Belmar (Feb) and solo show at Georgian Court (March). Today, Friend of the Studio Bobbi Seidel included a plug for the Belmar show in her Friday Art News column in the Asbury Park Press. Tomorrow- back to the Studio to start coloring my new print. It's too soon to start coloring my new prints, but not too soon to start thinking about color. 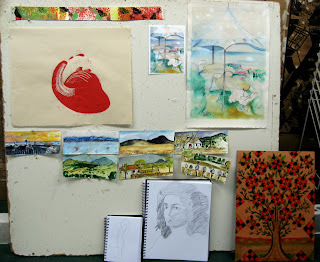 So I went up to the Studio for a few hours in the afternoon to do that. The first question might be why I want to color this in the first place. It looks pretty nice as is, but it's not complete. It's cut for coloring. I prefer my black and white prints to have interesting compositions with masses of black, white, and gray, like the print on the right in the top photo. By comparison, my new print (on the left) is mostly just black line and feels incomplete. However, I hope that I can achieve my usual balance of value shapes through the use of local color throughout the composition. And I'll get all the other benefits of using color as well. I started out by testing my new watercolors, some of which may be used in the basic palette. I figure that a print this large and this complicated will only work in color if the bulk of it is variations on a few basic colors. 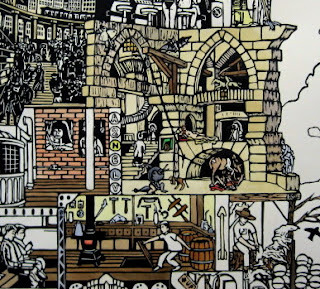 Since my starting point for this piece was one of Bruegel's Tower of Babel paintings, I decided to start there. Mixing colors old and new, I came up with a hue that closely resembles the light colored stone that makes up most of Bruegel's tower. I'll use it throughout the structure, tinting it as needed to be different kinds of stone, wood, etc. I also looked at blues, since there is a lot of sky in the print. I had brought an old photo album with me, so I devoted time to mixing colors of some specific objects from my past that appear in my tower. I brought my color mixes home to consider over the next few days. Unless I change my mind, I'll start with some of these the next time I'm in the Studio, and see what happens from there. Today was the day I set aside to finally print my tower block. The first step was to set up a registration system on the block. I marked out end lines and a centering mark in pencil, then attached pieces of mat card to the block with wood glue, right along one end line (see top photo). Clamped them, then got some lunch, which gave the glue time to dry. Removed the clamps and started inking. The first inking of any block always takes a little longer, and with a block this size, that meant over an hour of carefully rolling on ink with my various brayers. A few pieces of masking tape where needed, then I was ready for the paper. I put one edge right up against my mat cards, matching centering marks (paper and block), then let the paper roll down the length of the block. Next was all the rubbing. 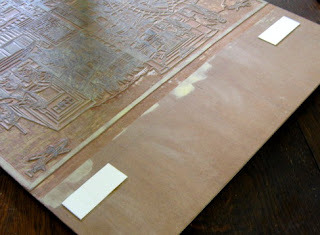 After going over the whole block with various rubbing implements, I started pulling back the print from one side to see what needed re-inking (see middle photo). Quite a bit as it turned out, but with perseverence I got through it all, first one side, then the other, again taking about an hour. The time spent was worth it. The last photo shows the first proof of the block. (click to enlarge) Always takes a little while to get used to the appearance of the print after seeing the reversed image for so long, and I've been working on this block since last summer. In this case the overall composition is fairly symmetrical, which may lessen the shock. I'm happy with the results. I pulled a 2nd proof, which went slightly faster. Both proofs are good- even inking, minimal stray marks. I hung both up on tack boards to dry. 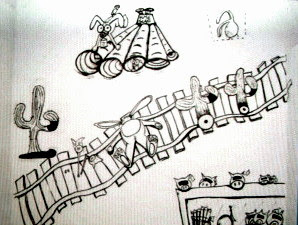 Phase 1 of this project was planning the composition and doing the block drawing. Phase 2, cutting and printing, is now complete. In a few days I'll start Phase 3, coloring the print. Up early and down to my community college for the semi-annual pre-semester colloquium. When I got home in the afternoon I called Carolyn, the member of our four person show who took responsibility for the card. She had said she expected to have them available today and this was the case. She had me meet her at a bar in Neptune, where she was part of a birthday celebration. The card she designed is seen above. Since the four artists have nothing in common other than living in the area and being the winners of the show, we decided to make our diversity the theme of the exhibition. We all submitted images to Carolyn, who used her graphics skills to put it all together. 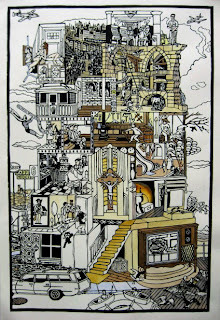 That's paper construction, watercolor, woodcut, and photography. I'm pleased with the card except for one thing- my name is misspelled. Unfortunately, this happens too often when I don't do the cards myself. As for the show, it opens at the Boatworks on Saturday, Feb 2, with a reception from 3 to 5 pm, and will remain on display through February 23, open to the public 12-4 pm on weekends. Sitting at home in evening after a long, unexciting day at my sub job, and I heard a pounding at the door. It was a good thing, the delivery of the art supplies I ordered from Daniel Smith last week. The most important thing is those two cans of relief ink, meaning I should get the tower block printed this coming weekend. 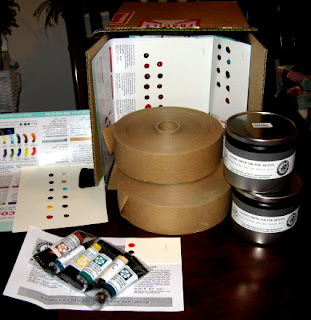 Some of those tubes of watercolor paint may also be put to use when I start coloring the print. The other colors will remain on reserve until I have a need for them. I don't need the paper tape right away, but now I don't have to worry about rationing out the last roll I had. They threw in a free bonus, some dot cards. 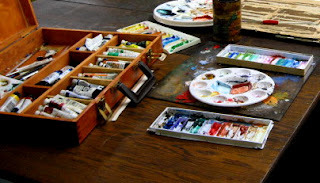 Those little dots of color you see are dabs of dried watercolor, which can be wet with a brush and used. Not enough paint for me to make use of in my art, but enough to test various strengths of the 30 or so different colors, mostly from their specialty lines and mostly new to me. If any are particularly interesting, they may find their way into my next order. It's been exactly one year since I started this blog, way back last January 15. It's been a typically busy year since then, as described in the 237 entries that preceded this one. Some of it was exciting, much of it just the routine of an active artist. Today for example. I returned a phone call related to the announcement postcards for my upcoming 4 person show in Belmar. 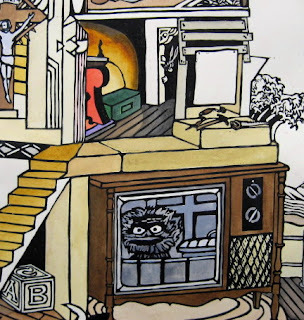 I sent some advice to a former co-worker, now relocated to Florida, about how to improve her drawing of a room interior. I followed up with someone else about plans to have her model for an upcoming project. Maybe tomorrow will be more exciting. Come back and see. When I got home from work today I had a phone message from someone on behalf of the Exhibition Committee at the Printmaking Council. He wanted to discuss some ideas for upcoming shows in the PCNJ gallery space. I first joined the Exhibition Committee almost a decade ago- the newsletter solicited ideas for shows from members, and when I proposed one (a showing of the Reading Blake group folio that I organized with Tom Huck), they decided anyone who cared enough to suggest a show should be on the committee. Back then we tended to meet fairly often, but the composition of the group has changed a lot over the years, as has my job situation and availability. In recent years we've been meeting occasionally, usually linked to us all being up there for a reception or something, but most of our business has been handled by e-mail. In the evening I called this Andrew, who tells me he's now co-chair of the Exhibition Committee, and we ended up having a long conversation about some of the plans for 2008 and beyond. He mentioned some ideas he and others brought up. I had no specific ideas to offer, but I was able to offer my opinions and suggestions regarding those ideas. The discussion will continue later via e-mail. Got a great present in the mail today- a New Year's watercolor from by old college friend David Lasky. Dave and I go way back to the first college art class I ever took, and he was in most of the undergraduate art classes I took after that, including my first printmaking classes. We collaborated on a number of comics projects over the next few years, but none proved commercially viable. (yet) I decided to put my comics career on hold and pursue graduate degrees in printmaking, but Dave kept up with the comics, eventually relocating to Seattle and achieving quite a reputation in the independent comics world. 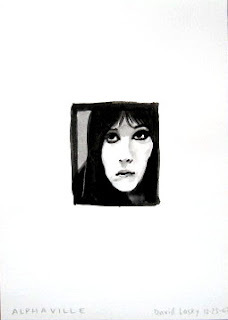 This year as a holiday gift he sent out a bunch of small (the image area above is 3" x 2.5") watercolor paintings based on French New Wave and related cinema. I got one of his Alphaville images, as you see above. 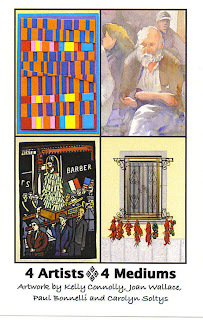 For the rest of the story of these cool little paintings, as well as a link to a bunch of others, check out his blog. You can see a little sampling of some of his comic pages on his main website, here and there around the internet, and at better independent comic shops everywhere. It was still unseasonably warm today (in the early afternoon anyway) so I took a little break from coloring, and a stroll into Asbury Park. I expected I'd find Molly in the restaurant where she sometimes works, and I did, but she had some good news I didn't expect. The article that we were going over just a few days ago is already in print, following what looks like some significant rewriting by reporter Jason Thomson. 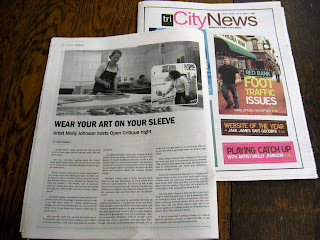 This is the TriCityNews, an Asbury based news and arts weekly whose main beat is 3 of the artsier municipalities along the Monmouth oceanfront- Asbury, Long Branch, and Red Bank. (I've exhibited my art in the latter two) The TriCity has long been a big supporter of Molly, having written about her as far back as 2005. In fact, the large photo above of her at work in our Studio was from a session taken for an article they did about her in 2006. What's different now, besides the subject being the discussion group instead of her art, is that this time I wasn't cropped out of the photo. 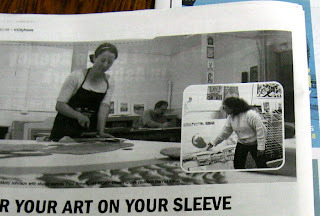 (that's me between Molly and the inset photo from last week's crit night) Plus, the Studio and I are mentioned in the article, which could lead to a contact or two. But the important news is that the critique group got a great write up, which could result in some new people participating in the group in the coming months. 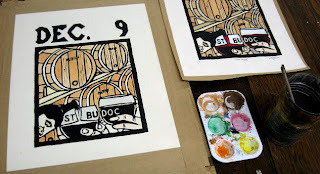 Since I'm going to have to wait a little while before continuing on the tower block, I took advantage of some time in the Studio to take care of a back project- coloring a proof of the St Budoc print. The print was pulled probably back almost a year ago, was stretched on a drawing board, but I never got around to coloring it. But with a bunch of shows coming up over the next few months, I figure I might need another copy of the finished print. I used the color state proof (upper right) as a guide. The photo here shows it in progress, but this is a simple one to color, so I easily finished it before going home. If you want to get a better view of the final print, you can see it here. Tonight I finally took care of something that I had put for several weeks- ordering some much needed art supplies. The big thing was printing ink. I'm almost done with my last can. What's left is enough for a bunch of small/medium prints, but probably not enough for one printing of the tower block, and I'll want to pull at least two good prints to start. Another supply I had dwindling was gummed paper tape. Nothing fancy, just brown kraft with adhesive on the back- wet it and stick. 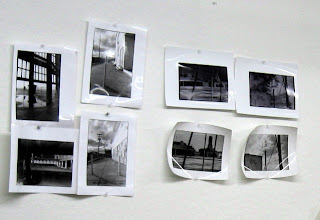 I first used it in my intaglio class, where we stretched damp prints right on the wall so that they'd dry flat. 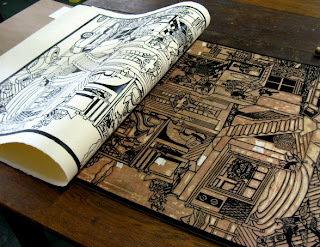 I've mostly used it since then to stretch woodcut prints prior to coloring. The watercolor causes the paper to swell and buckle, but with the prints taped down, they contract again to their original flat state. 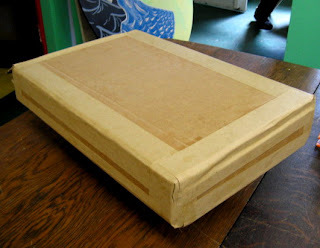 I also use it for box construction, where the drying tape bonds with the corrugated to make a solid structure. I used to get giant rolls of the stuff at Pearl, but the last few years they haven't stocked it, and I'm beginning to run out. I asked last time and was told that their supplier stopped making it. I wouldn't send to Seattle just for paper tape, but as long as I have a package coming, why not stick a few rolls in it. I rounded out the order with a variety of watercolors. Mostly colors I didn't have already but think I could use. If all goes well I'll have the stuff in about a week. Which means I should be able to get the tower piece done in time for the March solo show. Things around the Studio were not quite so exciting as last Wednesday's discussion group, but we both had stuff to keep us busy. Last night Molly had e-mailed me a rough draft of an article she's submitting to a local publication. I brought a hard copy with me to mark up as I suggested edits. We clarified a few sentences and talked about possible additions. Then we went about our own tasks. I was busy getting ready to order some art supplies, which included doing a full inventory of my watercolors. Checked to see what I have, what needed to be replaced, and what new items I could use. This will be part of a larger order including ink and other supplies. 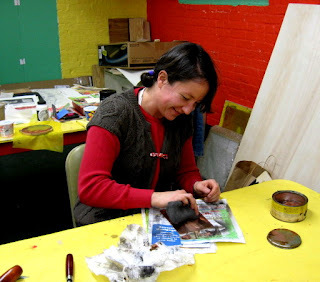 Meanwhile Molly was working on a mezzotint. Between the rocking, the burnishing, and the polishing, she felt she was getting some really good exercise. Later she put a bunch of her (mostly unfinished) work up on the wall to consider in preparation for a show she expects to be part of later this month. 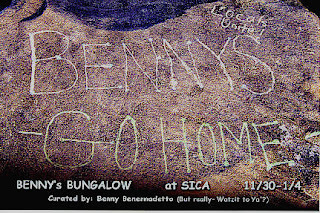 After work today I made the trip to Long Branch to catch the Bennys Go Home show at SICA on its last day. 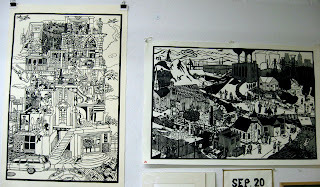 The show was curated by 3 artists from the New York/North Jersey area, and included two dozen of their fellow Bennies. Anyway, one of the 3 curators was Victoria Hanks, who I know from a few years back when she found my slides in a registry in Newark and curated me into Seven Deadly Sins, a group show that was supposed to be there in Newark, but ended up in Soho. We keep in touch occasionally, and she in fact invited me to participate in this show. I reminded her that I was actually a beach town resident, and we agreed that I wasn't really a candidate for a show with this theme. I told her I'd come to see it, but a busy semester and holiday season kept me away until today, the final day. It was worth the visit. 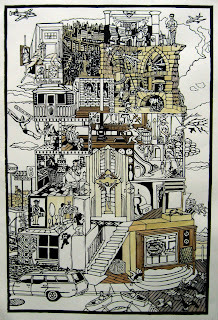 My friend's very large wall drawing (see above) was really cool. Some other familiar people in the show- Ben Goldman (also part of the Sins show), Jose Camacho (former classmate from my painting days at Montclair State), Len Merlo (took one of my woodcut workshops years ago), and Tiffany Calvert (whose work I remember from one of the "Fresh Meat" shows of recent NJ MFA's that this space hosts every spring). Since Vicki has told me that she'd like to put me in another show someday, maybe I'll be running into some of these people again. After a few mild days in a row, tonight we had what felt like the coldest weather since the last discussion group. No matter- we have a good heater in the corner, hot beverages for those who want them, and another lively discussion. The first two photos show a variety of work from a lot of our regulars, including a bit of my long in progress tower block. Two of our regular group member weren't there tonight, but we had two new people (new to the group, but not to the Studio) bring work to show, seen in the last two photos. 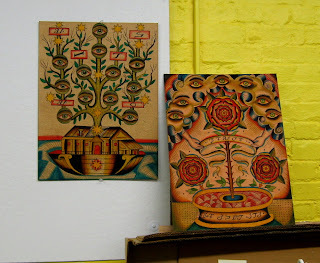 That includes some much cooler than the usual b&w photographs of nearby Asbury Park from Molly (not the one who shares the space) and Rob's intensely complex symbolic/mystical paintings. As a special bonus, today marked the 2nd anniversary of the founding of our joint venture in the basement. I had gotten a Christmas card that year from Molly, requsting a meeting to discuss some print issues. Over lunch that turned out to be her need to find a home for her press, one where she and maybe others could use it, as well as a desire to start a regional print organization. She told me about the Jersey Shore Arts Center and some of the available spaces. I went right over to check it out, and called her right then to say I wanted in. It would be a few months before we started moving in. Just a reminder that tomorrow is the first Wednesday of the month, which means it's the meeting day for the Social Animal Press art discussion/critique group. All are welcome to participate, any medium. 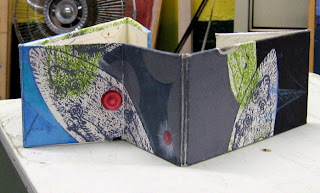 Just bring an artwork or two (last time Molly showed a book arts piece, seen above) to the Studio and join the professional level dialogue. January 2nd, starting at 7 pm and going until 9 pm, or whenever it breaks up.